Sunflowers are appealing for their bright color and the vibrance that they bring to the landscape. Blooming commonly in summers, I feel there can be nothing more soothing than the view of a field of Sunflowers in the scorching summers. So today I thought of doing a summery sunflower nail art. 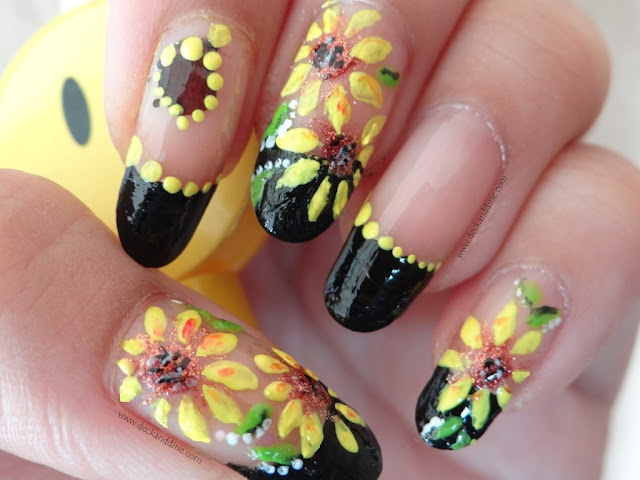 It is so easy to do and I hope you enjoy this sunflower nail art design! Paint a black French manicure. I drew flowers only on three nails, leaving the ring and index devoid of flowers. Well, you can draw flowers on all nails. So using the shimmery brown nail polish I draw the center of the flowers on the three nails. Now take the yellow nail polish and draw petals. Paint the petals little bit smaller on the sections where there is no more space. Now using the green polish draw leaves. Time for detailing. This totally depends on you; like how much in detail you want to go. I prefer basic shading and highlighting. So I just took the same brown nail polish and filled in between the petals concentrating on the lower part of the petals. Then I mixed the green and black to get a darker shade of green with which I shaded the leaves. With white nail polish I just added a few tiny dots beside the leaves. With the black polish I applied tiny little dots over the brown polish on the center of the flower. For the other two nails on which I didn't draw the flowers, I just applied yellow dots on the smile line of my nails; first one big and then getting smaller as you move from one side to another. i encircled my vote ink with yellow dots too. Let everything dry, apply top coat and you are done. I am not a great painter and moreover, don't know why I had really shaky hands today and thus the drawing didn't come out the way i wanted to . Just hope you find this tutorial useful. And hope you like it in spite of the not so tidy work . Don’t forget to pour in your comments , suggestions and give a G+ if you like it. Aaahh !! So beautiful !